So wrote Zurich’s Neue Zürcher Zeitung. The Frankfurter Allgemeine Zeitungdeclared that the Mandelring Quartetis so good, it is a worthy successor to the Alban Berg Quartet. The leading Austrian arts magazine, Die Bühne, writing of their Shostakovich cycle at the Salzburg Festival, named it as the “heir of the legendary Borodin Quartet.” And the renowned international music magazine Fono Forumnamed it one of the six best string quartets in the world. The Mandelring Quartet’s expressivity and remarkable homogeneity of sound and phrasing have become its distinguishing characteristics. The four individual members perform as one in their shared determination to seek out the innermost core of the music and remain open to the musical truth. By grasping the spiritual dimension, exploring the emotional extremes and working on the details, these musicians probe far beneath the surface of each work, thus revealing the multiple layers of meaning inherent in each. Their approach to the music is always both emotional and personal. Formed in 1983 in the German wine region in Neustadt an der Weinstrasse, three Schmidt siblings – Sebastian, Nanette and Bernhard - join with violist Andreas Willwohl in a partnership dedicated to exemplary performances of chamber music. Their success in winning some of the world’s great competitions – the Munich (ARD), Evian and Reggio Emilia (Premio Paolo Borciani) – launched an impressive international career that brings them to all corners of the globe. Along with their regular series of concerts in Berlin and Munich and performances throughout Germany, their concert tours have taken them through Europe – Amsterdam, Brussels, London, Madrid, Paris and Vienna; annually to North America – New York, Washington D.C., Chicago, Los Angeles and Vancouver; to Japan — Osaka and Tokyo; to Central and South America – Buenos Aires, Lima and Montevideo; the Middle East and Asia – including recent appearances in Dubai and Abu Dhabi. The Mandelring Quartet has enjoyed highly successful appearances at major international Festivals including Lockenhaus, Montpelier, Montreal, Ottawa, the Schleswig-Holstein Music Festival, the Enescu Festival in Bucharest and the Salzburg Festival where they presented the complete cycle of 15 string quartets of Shostakovich over two days in 2011. The Mandelring Quartet’s own festival, the HAMBACHER MusikFEST, is an annual meeting place for lovers of chamber music from all over the world. 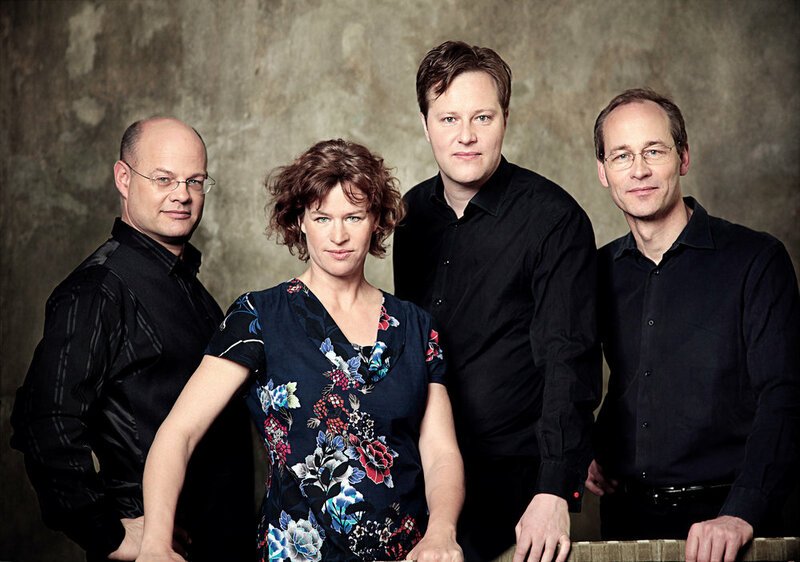 Since 2010 the Quartet has presented a regular series of concerts in its hometown of Neustadt, in the Chamber Music Hall of the Berlin Philharmonie, and si=nce 2016, in the Munich Residenz. Their discography include more than thirty CD recordings, which have been repeatedly awarded the German Music Critics’ Prize and nominated for the International Classical Music Award, confirming the Mandelring Quartet’s exceptional quality and wide-ranging repertoire. Their recording of the complete string quartets of Shostakovich was hailed as one of the finest complete recording sets of our time. Their recordings of works by Schubert and Schumann have been selected as new benchmark performances, and their more recent CD of the string quartets of Leos Janáček received a range ofawards. The Mandelring Quartet recently recorded the complete chamber music for strings by Felix Mendelssohn on four CDs.The complete String Quintets and Sextets of Johannes Brahms were released in 2016 and 2017 as part of a series of Brahms complete chamber music for strings.In 2014The Strad, the leading English-language classical music magazine made the Mandelring Quartet its cover feature. The Mandelring Quartet celebrates its 35thAnniversary during the 2018-19 season. Shooting sparks of vitality. Mandelring Quartet set milestones for Schubertiade start. “A work by Berg can be played in two ways: coolly and analytically or with full tone and great pathos. The Mandelring Quartet combines the two approaches and masters the score with breathtaking precision." “The F Major string quartet by Brahms’s contemporary Felix Otto Dessoff is ‘charming, compositionally ambitious, free from any deliberate display of erudition, and never derivative’, and lauds the Mandelring Quartet‘s ‘manifest delight in surprising us with this elegant work’. The musicians exploit Dvořák’s American Quartet to the full with supreme skill: the vitality of the opening movement, the spacious Lento, so touching and full of yearning, the rhythmically witty Scherzo and the irresistibly fiery finale. The Mandelring’s rendition became a somber yet rugged C minor sound-world. This contrasts with “charm and a touch of dance-like swing” in the third movement, and a “tenderly beatific cantilena” in the encore, the Andante cantabile from Tchaikovsky’s opus 11. “The Mandelring is a quartet’s quartet, matching technical finesse with insightful interpretation. Its rendition of Beethoven’s Quartet Op. 18, No 2 was a winning balance of charm and meticulousness presented with exacting care and attention; the trajectories of the individual movements and the overall whole were fastidiously defined and elegantly delivered. Gyorgy Ligeti’s Second String Quartet dates from the 1960s, and sounds like it. Cast in five short movements, it explores the extended techniques and textures that seemed so revolutionary at the time, but were actually following pathways blazed by Bartok three decades earlier. No matter. Familiarity with Ligeti’s once-difficult idiom made the brilliance of the Mandelring’s flawless presentation all the more evident: the work received a strikingly committed performance. Shostakovich’s Second String Quartet (1944) rounded out the program. Accuracy and precision are the Mandelring’s exemplary virtues. Here these were matched by deep feeling, and one was never at a loss to understand the rhetoric of the work. But the lasting impact came from a vision that stressed Shostakovich’s place in the historical string quartet tradition and his eloquent use of its shared language, not just his own Soviet-Expressionist dialect. Rarely have we witnessed this remarkable music delivered with such nuance, logic, and clarity.